As explained in the previous post on my internet-based photography business, the goal which drove the design of the terragalleria.com site was to license images and sell prints of photographs already created during personal projects, directly from that website. This has been my sole path to a full-time photography career which supports me and my family. This, the final installment of my series about my photography business (1 | 2 | 3 | 4 | 5 ) discusses how I managed to generate the amount of internet traffic I needed to pull it off. This approach will not work for everyone. When designing your site, you need to define clearly your own objectives, because some goals are just orthogonal. Assignment-based photographers often just want to refer potential professional clients to an online version of a portfolio. A fancy Flash-based site showcasing their specific vision with an extremely tight edit of images and a matching design (the kind that wins design awards) may be the best way to impress a client, but such a site will never pull a large amount of traffic by itself. Others may have intermediate goals: for instance a wedding photographer tries to book jobs with a specific clientele, but this clientele consists of the general public, and there is a good chance that they could find him on the internet by stumbling onto his website, so some of the ideas in this document would apply. There are three ways for someone to land on your website: they can visit it directly (typing the URL, using bookmarks or lists), follow a link from another website – including a social media site, or click on search engine results after typing in keywords. The first way is most beneficial to you, because it is conductive of repeat visits. Repeat visitors are the audience that you are trying to build, those who truly appreciate your work and are most likely to buy something from you. Artwork is not a commodity, therefore priced accordingly, and seldom bought as an impulse purchase. On the other hand, search engine users are fickle. In my case, the majority of them stay less than a minute on the site. The majority do not visit any other page than the one they landed on, returning immediately to the search engine page (this is called a “bounce”). You can see on the graphic below (Google Analytics) that a substantial portions of the visitors to terragalleria.com are returning visitors. Terragalleria.com has been around for a decade, which is a long time on the internet. If your site is relatively new, your traffic will come almost exclusively from search engines, and maybe social media links, if you are very active. Yet, designing your site so that visitors will want to come back time and time again should be your highest priority. The only way to do so is to repeatedly create a great user experience. This means high quality content (images plus text) and great design (beautiful and easy to use). The often repeated “Content is King” has never been truer, but delivery is also essential, because most photographs do not function best individually: images have to be organized in a coherent and pleasing way, with an easy navigation (including an internal search function) which makes the site attractive and useful. Photographs are useful for what do you ask ? Many visitors have told me that they use the terragalleria.com site to help plan their vacations or even photo shoots. The good news is that making your site user-friendly will also often make it search-engine friendly. 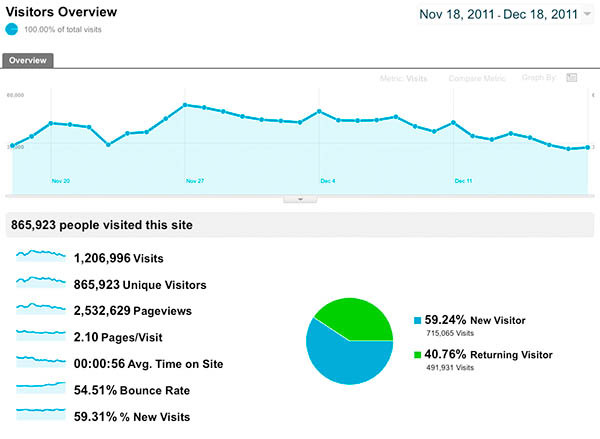 If you love your visitors, the internet will love you back. The bad news is that it takes a lot of work over a long time. I do not design for search engines, but rather for humans. Whenever I am faced with a design choice, I think first about visitors. Let me give a few examples. I have an image category titled Waterfalls. That page includes all of my 400+ images of waterfalls. I could have used multiple keywords such as “waterfall”, “waterfalls”, “water fall”, “water falls” to try to target more, but decided against it, because it would have made it more difficult to browse. On my National Parks page, I could have repeated the word “National Park” with the name of each park. I decided against it because that would have cluttered the page. The visitor already knows he is looking at National Parks ! Yet try a Google search for images of national parks using a variation of keywords and constructs, and see who comes on top. On a page such as Olympic National Park, I could have placed tons of legitimate keywords just by writing captions below the photos (they are in a toolip instead). However, this would have prevented images from filling the page at all window sizes. Also, I find that words get in the way of the images – which is why many fine-art photobooks do not print any words at all next to the images, and instead place captions in a separate section. So in this case, I’ve broken on purpose a cardinal rule of SEO (which I’ll discussed later). After people type keywords in a search engine, typically thousands, if not millions of results are returned – see the example below, which involves a particularly competitive query. However, studies have repeatedly shown that most people will look only at the first page of results. There is absolutely no way to guarantee that your page will feature on this first page based on organic (unpaid) results. Anybody who tells you otherwise is simply a crook. On the other hand, it is possible to guarantee a top placement with paid results, by buying advertising space on search results pages (the right column in this example). However for a photography site this could be a costly approach. You are not amazon.com. Most visitors do not come to your site to buy anything, so you would be paying for a lot of clicks that do not generate business. Search Engine Optimization (SEO) is the process of improving the visibility of a web page by making it higher ranked in organic search results. Because of examples such as those shown above, people sometimes assume that I am a SEO expert, who has mastered complicated and obscure secrets. There are no such secrets. The reason why it is easy to feel confused about SEO is that, within a decade, an entire industry has grown around it, which often relies on smokescreens and hype, if not on sneaky tactics that would be better described as Search Engine Abuse. I do not rely on any such trickery and do not recommend that you do so. Abusing search engines reduces the effectiveness of the very technologies you’re depending on. Whenever someone thinks of a way to artificially improve their web page rankings, every SEO “expert” does it, making the field level again. Not only that, but if you attempt to cheat, the search engines have become so sophisticated that eventually you’ll be found and penalized, sometimes heavily. Google has often dropped entire websites from its search results. I do not wish to give negative examples here, but I’ve seen several photography websites that looked to me built more for search engines than humans plunge dramatically and suddenly in traffic after doing very well for a period of time. The most important thing is to understand that the “rules” of SEO aren’t magic. They are simply based on any search engine goal, which is to return relevant and trustful results. Once you’ve understood that, the fundamentals are common sense, although the results themselves can almost never been predicted with certainty. I am often puzzled by search results. I’ve read that the algorithms used by modern search engines are some complex that even the software engineers who created them cannot predict their outcome. Because these days Google is so dominant, all the technical details you need to know are listed in Webmaster Guidelines from Google that you should study carefully. I also recommend to open a (free) account with Google Webmaster, as this will provide you with a lot of data relevant to your SEO. In the rest of this post I will concentrate on the big picture, because there are a number of other articles about SEO for photographers which do a good job at commenting on technical details. Some of the most useful are listed at the end of this article, but study the Google document first. I mentioned earlier that one should design for humans, not for search engines. For photographers, there is one important exception: while humans (and, to some extent, artificial intelligence programs) can understand images, search engines cannot: they are text-based. For a human, an image is worth 1000 words by itself, but the search engine explicitly needs those. That’s why Google image publishing guidelines explicitly asks you to “tell as much as you can about the image”. That’s also why I advice against the use of Flash as a main platform for the purposes of SEO. Flash is a visual technology: the text is mixed with the rest of the design, you cannot cut and paste it, nor can search engines make sense of it. Flash designers claim that there are workarounds, but I have yet to see any Flash-based webpage achieving high ranking for a competitive search. On the other hand, if you treat Flash content as an image, making it only a portion of a page and surrounding it with text as explained next, you should be OK.
What should the text be ? Anything that you think is relevant. Remember that search engines reward relevance: it is easy for them to figure out that pages are irrelevant by counting bounces. However, since search engine users enter just a few words in the search engine boxes, you have to think which of those search terms (“keywords”) each webpage is going to target, which simply mean include in a prominent manner. The main trade-off with keywords is popularity (how many people search for them) vs competition. The more popular the keyword, generally the more competitive it is. You can compare specific keyword popularity across time and places by using Google Trends. The Google Adwords Keyword Tool provides a measure of both competition and popularity, so that you could try to target popular keywords with less competition. Each combination of words is different. You cannot try to win by “optimizing” for many of them at a same time, as search engines detect “keyword stuffing”. Try for instance a Google search of “america pictures” and compare with the above. If you will allow me a short digression, I’m very pleased to see Jacob Holdt‘s work so well placed, since I think it is important. However I suspect that what got it there is not only its cultural, historic, and artistic importance, but also the fact that the body of work is so extensive (more on that next). Where should the text be ? The brief answer is everywhere ! However the single most important element on each page is the TITLE tag (this is the text you see on the top of the browser bar). Each of your images should be on its own HTML page, and have a brief but keyword-rich and unique title. If all of your image pages have a title such as “My Name photography” (as I often see), you’ve wasted the most precious real estate on your website. Next in importance is the ALT tag text, which is the surest way for you to associate words with a specific image. Search engines rely heavily on the ALT tag, but it is barely visible to humans, so you also need a descriptive caption next to the image. Although far from ideal, it’s OK to use the same text for those three elements – that what I’ve been doing to save time. Then, you’ll also want keyword text in your navigation links, headers, description tag text, URL, and image filenames. Here again, I made the mistake of ignoring the last two ones, for the benefit of the convenience of using just an image number instead. What does the fact that I’ve done well in spite of not following some “rules” tell ? That those technical details are merely tweaking. One of the two most important factors in high traffic numbers – one that I rarely, if ever see mentioned in SEO articles, is what I call the “footprint”. I like to use the following analogy: the internet as the earth, and your visitor as an asteroid from space. The chance that it will land in your country is proportional to its surface. Likewise, everything being equal (which is obviously not, more later), the chance of a visitor landing on your website is proportional to its number of pages, which is more or less the number of images in the case of a photography website. I am convinced that no matter how great your images are, if you do not have massive numbers of them, it will be very difficult to achieve high visibility through SEO. That’s why, for the purpose of selling work on the internet, it often isn’t productive to show only the very best of your work on your website. A portfolio is necessary for client meetings. It doesn’t hurt to have it on your website (although I’ve done well without one myself), but if your website consists exclusively of a portfolio, just do not expect to draw any significant amount of traffic. As of this writing, there are more than 27,500 images on terragalleria.com. While some redundancy is inevitable for stock photography sales, I am making sure that each image contributes something a bit different to the whole. This was not built in a day, or even a year. As you can see from this site timeline, for the past ten years, I have strived to post at least 200 images every month. Having fresh and varied content is important to hold your visitors interest, and to signal to search engines that your site is not stale. If your website structure is not amenable to frequent updates, use a blog. SEO is simply not a short-term endeavor. It takes several years for it to pay off, because besides a large site, what you need to build is trust. Besides the footprint analogy, how does in practice having many images help you ? This has to do with keywords. It makes it possible for you to organize your website in a layered way so that you can satisfy searches both for popular and less-frequent queries. 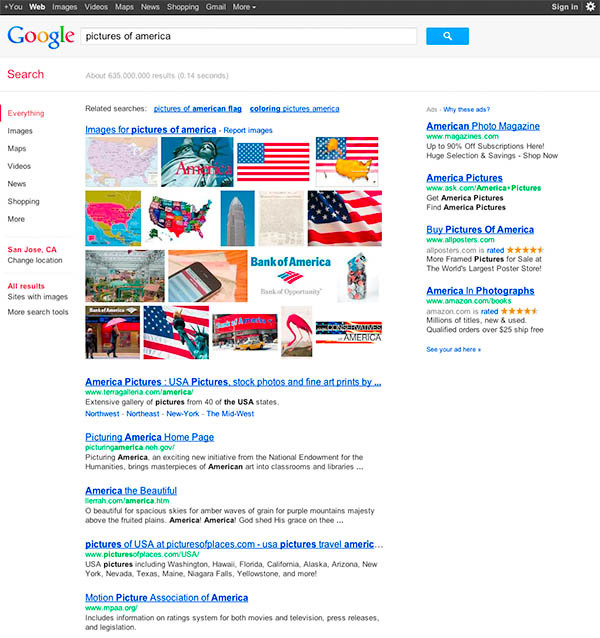 First, let say you are trying to rank high for a popular keyword (such as “Pictures of America”). If site A has 15,000 relevant images, and site B has 50 of them, who do you think will be identified as most relevant by search engines ? I am not saying that all images should be on a single page. A nested structure is the most natural and gives many options. The other important factor in high traffic numbers is trust. Factors that contribute to trust are the time your domain has been on the internet, as well as possibly its expiration date. However, these are insignificant compared to incoming links – although it could be argued that receiving links is a byproduct of long tenure on the internet. The breakthrough of Google was to make use of the link structure of the Web to calculate a quality ranking for each web page. The original research paper co-authored by Sergey Brin and Larry Page (shorter version) is an excellent read if you want a good understanding of that algorithm. Nowadays, all search engines use that idea: the more websites link to your website, the most popular and therefore the most trustworthy it must be. Not all links are equal: the only ones that help are genuine links from important sites. Links from authoritative sites count more than links from obscure sites. The main metric used to assess the importance of a web page is Google PageRank (PR), a number between 0 and 10, named after Larry Page. The scale is exponential, so a link from a PR 5 site is worth maybe 10 links links from a PR 4 site and 100 links from a PR 3 site. terragalleria.com has a PR 6. You can examine the PR of a given page using a number of PageRank checker websites, although by far the most convenient is to install the Google toolbar if your browser supports it. You can also check the site popularity with tools such as Alexa. What also distinguises links is the text. Ideally, it should be matched to your keywords, but in general you do not have much control, since you are not creating the link. Take advantage of the few instances when you can control it, such as links from your other websites, family, friends, and associates. Obtaining links on other sites is getting harder. The web used to be more open, unfortunately abuses from link spammers are rampant: my blog receives about 400 spam comments daily. Those spammers have ruined it for everyone, forcing every site owner to control more tightly external links. In general, the links that come with contributions/signatures on blog comments or forum posts are automatically tagged as “nofollow” by the site software. All links from the Wikipedia (which have been cleaned-up considerably), Flickr, and even Linkedin (!) are now “nofollow”. This makes them secondary for SEO purposes as they are not followed by search engine spiders, and do not transmit any PR. The exception to all those sites that provide only “nofollow” links would be directories sites, starting from general directories such as Yahoo and dmoz, down to photography and local business directories. The main limitation is that pages on a directory site have tons of links, resulting in the dilution of the value of your link. A webpage page has a fixed PR to pass. If it links to 100 sites, then each of those sites receive only 1/100 of the PR. The same problem, dilution, reduces the usefulness of links from social media sites, maybe unless you manage to get a “viral” propagation. A strategy that I see more and more is to offer content (such as guest blogs, feature articles) in exchange for a link. Such content is often produced by cheaply paid writers. I receive such requests, as well as link exchanges requests daily. But why should someone link to an irrelevant website of inferior PR ? The problem with some of those strategies is that you are trying to mess with the ultimate organic mechanism of the internet, creating links that are not genuine. Google explicitly warns against artificial linking. They do not indicate trust, but rather manipulation. The widely used practice of “exchanging links” is actually detrimental, especially if the other site is irrelevant, or even worse, part of a “bad neighborhood” such as a link farm. I don’t think you are going to create a link farm, or a network of false blogs, but maybe that’s what the “SEO expert” you are hiring may do. Needless to say, this would very risky to you. If real people are linking to your site, it is because they had a great time there, and think it is worth showing to others. Instead of trying to create incoming links yourself, it is preferable to create awesome content, that make people want to link to you. It can often be easier to attract attention by writing about a photography-related subject such as a technique, gear review, business tips, esthetic considerations – opinionated and controversial topics seem to work well – than by posting photographs. There’s nothing wrong with that, as it indirectly helps you find an audience for your art. However, as a photographer, your ultimate goal should be to create superlative photographs, lots of them, that are good enough to make people want to link to you. So it comes down again to great work: the best you can do to improve your SEO is to go out and photograph. There is a great deal of material on the web about SEO for photographers. The authors below have demonstrated that they can not only write, but are also outstanding webmasters who have achieved great SEO results for themselves or their clients. In particular, the two first entries are good examples of personal photography website that generate business for their owners. Dan Heller’s book chapter on Web-based photography business: includes remarks on design and SEO from a pioneer, travel photographer, photography business consultant, and creator of the most extensive personal photography website. Phillip Colla’s SEO tips: great collection of ideas from a nature and marine photographer with a website which is a model of organization. The Photographers SEO pyramid (part 2, part 3): excellent and concise guide from promising photo hosting company Photodeck whose founder JF Maion has a personal experience with SEO on a personal photography site. The SEO cookbook for photographers from the leading photo hosting company PhotoShelter, well researched, like the rest of their growing collections of guides. Any questions after reading all this material ? Just ask away, as this entry is my Christmas gift to the (pro) photo community. Posted on December 20, 2011, 11:53 pm, by QT Luong, under Business. Great write-up QT. I’m curious as to how you make this quantity of work scaleable for you? Processing 27k images let alone putting them up on your site in an SEO-friendly manner sounds like a lot of work for one person and not for everyone. Good question, Richard. It is definitively not for everyone (who said it was easy ?). This is not scalable, as this is about the maximum number of images I can manage. For processing, I rely on one shortcut: online images are processed to a “work print” level. I do some more fine-tuning at the time of printing on purchased prints, the kind that would not be very visible on the web but apparent in a print. As for deployment, I have built over the years a very efficient CMS. Thanks for sharing your insights, QT. I’ve long respected your knowledge and abilities. Thanks for a great write up. I agree that the footprint is a big deal. Both the overall print of the site, and the page itself. That’s a little bit counter, though, to the idea that we should design for the user; most people, I expect, don’t want to land on a page with 100 thumbnails, but a smaller page with ‘next’ to more images. But it definitely seems to play a role in SEO. Did you pay for a Yahoo listing? I can’t seem to get listed there at all. Thanks, and merry christmas to you and your family as well. Carl, user preferences vary, but I assume not everybody likes clicking: see the way Google Images is set-up. My solution for locations for which I have many images is to offer both a representative set (the “overview”) and a page with all images. I didn’t pay for *any* listing, but I know the web has changed a lot in a decade. Agreed; I suppose smaler pages are more of just a standard than anything else, not so much necessarily user preferences. Right now it’s on ‘hold’ .. I’ve submitted a number of times and still don’t show up in their directory listing at all, but yours comes up numerous times. I’ve always thought you website is one of the best designed I’ve seen. Thanks so much. Thanks for a fantastic article, Tuan. That’s an impressive number of images to manage. Congrats on your SEO successes! Thank you for writing up this article. I’ve been looking forward to it since you mentioned it was coming last week. A lot to learn and digest here – I will probably wind up changing a few things on my own site to try to improve my results a bit. Thanks again for sharing this – not everyone would be willing to talk about how they did this successfully! QT – Not being someone who makes a living from photography, I still found this and your related posts very interesting… thanks for sharing it. Looking at Dan Heller’s site, he emphasizes business savvy rather than the photography itself and it sounds like his actual time taking photos is limited. It seems you’ve got a business model that lets you put the photography first, although you’ve obviously put a lot of thought into how you structured it. How do you think you’d tweak your model if you were just starting your business now, instead of 10 years ago? Thank you for an incredibly informative article. I was hoping you could answer one of my SEO questions – the importance of the URL. I set up my WordPress powered site 1 1/2 years ago and knew little about anything at the time. My target audience is the town I live in as I concentrate my landscape photography within those boundaries. I failed to obtain a domain with that town’s name in it (instead using a common abbreviation of it) and chose the day and name permalink structure. 1. register an additional domain with the same site name but spelling out the town. 2. change my permalink structure to domain/town/category/postname. This approach though is riddled with potential problems including 404 errors and need for extensive 301 redirects. Do I need to do either? Does the url structure matter when it comes to SEO? Chris, the internet has changed a lot in 10 years. A decade ago, it was considerably more difficult to share images (remember that Flickr was launched in 2004 ! ), let alone operate a large and organized site with solid e-commerce options. Nowadays, service providers, such as the two mentioned in “other great articles” let everybody do it with relative ease. So to say that there is more competition on the web is an understatement. When the size of the web was orders of magnitudes smaller, it was possible to build a relationship with an audience based on content alone. Content is still primordial, but as attention spans are getting shorter, engagement becomes a key. This is why we are seeing so much growth in social networks. If I was starting today, as far as web-based business is concerned, I would put more emphasis on this aspect: provide shorter and more frequently updated chunks of content, encourage commenting, sharing, and interactivity. I would also be wary of putting all eggs in the same basket, as I have done for the first ten years. Eyal, the URL structure definitively matters when it comes to SEO, because it does matter to users. A descriptive URL provides a preview of the topic or, in your case, area of service, and is easier to remember. From a technical point of view, the first approach seems easier to implement, as you just have to redirect old-domain.com/ to new-domain.com so you can keep the link structure identical. Thank you for the fascinating posts. Like you my website was first launched in 2001. I find that one of the greatest asset my website has is the length of time I have had my domain name. I still use notepad to edit my site, but that’s because years ago I implemented an xml based system. Today, I have been considering moving entirely to PhotoShelter or Zenfolio, but I have reservations that the uniqueness of SEO I had built into my site will be gone. I guess a question I pose to you is if you had it to do over again and you were just starting out, would you still build your site with a text editor as we did all those years ago? However, if I was starting from scratch, I would be very tempted by PhotoShelter because it would save so much development work. They correctly implement some of the SEO features that I have been neglecting, have better e-commerce, much more current design, and of course cloud redundancy. In your case, I would not recommend that you abandon your site, since like you realize, it has a long tenure on the web. Instead, use both. That’s what Phil Colla has been doing. Maybe you can ask him if he is satisfied with that setup, as he is a generous individual. Thank you for your input. I am currently utilizing Zenfolio (linked off my main site) and that has worked well for printing, but not well for stock licensing. I might contact Phil as you suggest to see what he thinks about integration. As a side note, I do like your search function, mine needs work, of course, since I built it myself it means taking time away from other things like photography, but sometimes it can be a nice diversion. A most interesting and useful series of posts. Thanks for sharing your valuable experience! Thanks for this series of very informative posts QT, I appreciate your candor. I’m only starting my 2nd (in earnest) year running my own photography site and I am heartened to hear logic still applies i.e. little & often; and that there if no magic bullet. I’ll continue to chip away with a tweak here and a tweak there and am hopeful to see my traffic, and therefore revenue climb. Just a follow up .. I think yahoo directory is now ONLY available via a $300.00 per year fee. I’m not sure whether or not it’s worth it. Do you have any thoughts on that? Carl, it’s difficult to put a value on such a link, but I suspect not, since the web has expended so much since the days when those directories were first introduced. I’ve been studying up about SEO, but am just getting some of the more in depth photography related scoop. Much of what you are discussing was new to me just a few months ago. I am grateful for the further education and for your generosity in sharing this valuable information. I’ve got a Photoshelter site up and running with a few hundred images uploaded in the past few months. Traffic is light and my sense is that establishing an online photo-commerce presence is orders of magnitude more difficult than it was ten years ago. This despite existing Internet capital I have in the form of a photoblog established 2004 (page rank 4), a successor photoblog that I started together with the Photoshelter site (leaving the old photoblog in place, of course), frequent Twittering of photo links, and a non-photo blog that I have been administering since 2001 (page rank 6) and on which I post links to my Photoshelter portfolio, using Photoshelter’s WordPress plugin which makes this easy to do. At this rate I think I may have to upload at least 10k images to get any significant financial return on this project, and that could take a while. Looking at it systematically, the main questions that I see are: 1) Can I significantly increase my production rate? and 2) Should I diversify my efforts into other photo revenue streams, such as print sales at art fairs, or micro/macro stock sales via agencies, that might provide faster returns on my efforts? I am skeptical that I can increase my production rate enough to solve the problem by that means alone. However, I think the diversification options, particularly the art-fair idea, may be worth pursuing as an experiment. Perhaps the meta question is whether it’s better to pursue a low-volume/high-price strategy or a high-volume/low-price strategy. My guess is that the answer is a function of the type of work one produces and one’s tolerance for risk. Any thoughts on these issues? Thanks for following up; my thoughts were in line with what you wrote. You rinput is much appreciated. I meant to comment on this post a long time ago. I found it extremely helpful, as well as the links to other good SEO advice. I have been studying SEO for over a year and could not get a grip on how it’s done for photography until I read your post. Your many posts on SEO are the most helpful I have read. I keep coming back as I let the information sink in and try different things you suggest. Many thanks. Im very slowly getting larger numbers of people to my blog with a very small bound rate. Something must be working. I have been watching your illegal SEO tricks for years. You were one of the first idiots to spam Wikipedia with hundreds of back-links on every Wiki National Park site they had ranking above a PR of 5. You took a big hit on that like everyone who did that illegal trick and lost your PR of seven. Because of greedy people like you, they had to change every page to “nofollow”. I check in now and again to see what other clever tricks you are scamming us with. I see you are now illegally placing the Adsense ads on the bottom of your pages hiding them as next page arrows. Nice trick, however I think Google looks down on this type of forced placement. I suggest you move the Adsense ads and place a valid “next page” arrow you can see on each page before they delist you. Maybe if you stopped the black hat SEO, you would once again rank number one for “landscape photography” like you did in the mid 90s. Not So Honest Abe, I think every statement you made is factually wrong, and if you show up again with a real name, I would be happy to have a respectful conversation with you to explain why. Logical thought QT, from top to bottom. Keyword stuffing and all that black hat SEO practices are definitely a no-no. There’s a reason why they call that “BLACK”. Your website is a testament that writing for humans and not for the search engines is still the BEST SEO PRACTICE. Great, Thanks for sharing such an important post. Still relevant in 2017. Thanks for sharing QT.